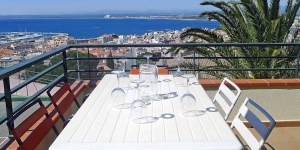 Las Alondras 1 is a 4-room apartment, 120 m2 on the 1st floor, located in a 3-storeys complex above Roses, 700 m from the centre, in a quiet, sunny position on a slope, 1 km from the sea. 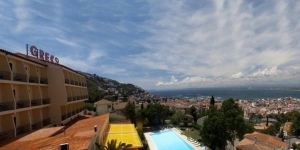 The property features shared swimming pool (12 x 6 m, 01.05.-30.09.) and tennis court. The apartment has: living/dining room 35 m2 with panoramic window with open fireplace and exit to the terrace; 3 rooms, each room with 2 beds; kitchen (4 hotplates, oven, freezer); bath/bidet/WC, shower/bidet/WC, separate WC; 16 m2 terrace with furniture and panoramic view of the sea and the resort. Surroundings: supermarket 700 m, restaurant, bar 200 m, sandy beach 1 km, indoor swimming pool 1.5 km. Golf course 12 km. Please note: car is essential. Jet skis, boat and trailers are not allowed in the building. This residence is only for families and groups of young people (under 25 years) are not permitted. The swimming pool is available only until 22:00 hrs.